Patients are becoming increasingly resourceful at finding information about what is important to them. That’s why this campaign featured patient relevancy. Biacna is by far the gentlest, yet effective treatment for acne. However, it needed a new brand identity establishing it not only as a first-line acne treatment but clearly communicating that it’s also the patient’s preference. The challenge was to convince physicians of this message within stringent medical advertising regulations. The strategy was to show that Biacna is on the patient’s side: clearing their acne but not hurting them in the process. 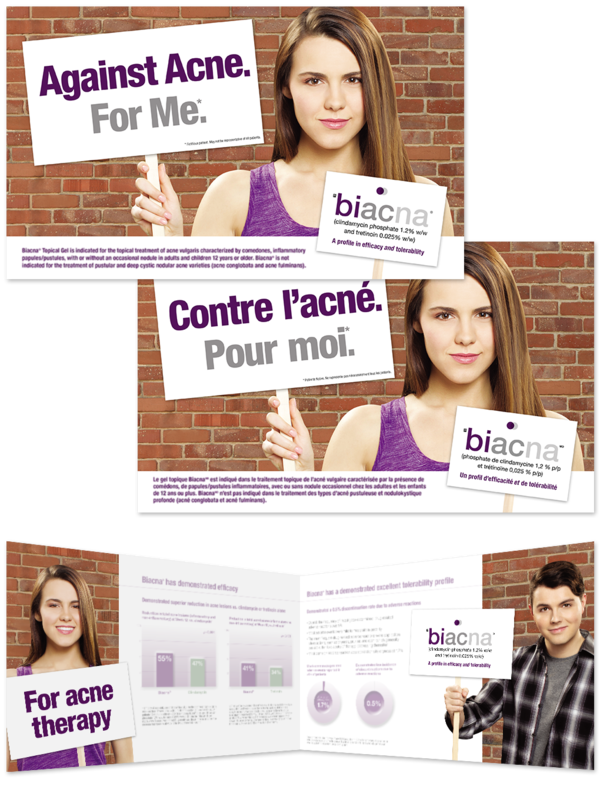 Patient advocacy was communicated by showing a patient ‘demonstrating’ that Biacna is ‘Against Acne. For Me’. Featuring a patient with successful results post-treatment shows efficacy to the physician. No call backs, just a happy patient.